Starting from this, up to nAma 313, are interpreted by SrI BhaTTar asreferring to the vata-patra-SAyI avatAra or the incarnation as a Child onthe banyan leaf. The Creator at the beginning of a yuga.om yugAdi-kRte namah.SrI BhaTTar gives the interpretation "yugasya ante'pi Adim karoti" - Even atthe end of a yuga, He makes the beginning of another. Even at thedissolution of the Universe, He saves it from the distress of Deluge bybeginning the Universe again; even at the end of the Universe throughpralaya, He begins Creation again. He is called yugAdi-kRt because He is the cause of periods oftime such as yuga. According to SrI cinmayAnanda, Adi here refers to otherdivisions of time such as centuries, years, months, days, etc. SrI rAdhAkRshNa SAstri suggests that through these divisions of time, likethe day and night following each other, He gives a meaning of continuity totime which is otherwise a never-ending cakra or circle with no beginning orend. The word yuga is derived from the root yuj - yoge - to unite. Hecreates the continuity or connectivity between one yuga and another byensuring that the life-forms are re-created according to their karma-s.
Arelated alternate interpretation given by SrI Sankara is yugAnAm AdimArambham karoti iti yugAdi-kRt - The Institutor of the yuga etc. It may berecalled that there are four yuga-s, kRta, tretA, dvApara, and kali. SrI satyadevo vAsishTha interprets yuga as kAla-cakra, Adi as beginning, andthe term yugAdi as referring to the Sun, who is the cause of the division oftime as day and night etc. He then interprets yugAdi-kRt as the One whocreated the Sun or One who created the kAla-cakra. The dharma cakram writer points outs the limited nature of our body and ourlife in this world in the context of this huge, immeasurable, and unending,kAla or time. Instead of wasting it on petty goals, and worrying about thepast which is gone or the future on which we have no control, we shouldlearn to meditate on Him in the present, over which we have control. He who revolves the yuga-s or aeons. Avarta refers to revolution or rotation. SrI BhaTTar's interpretation isthat He is yugAvarta because He makes the kRta and other yuga-s go roundagain and again with their respective dharma-s. (It is said that if theextent of dharma in the society in kRta yuga is 100%, that in tretA yuga is75%, in dvApara yuga is 50%, and that in kali yuga is 25%. kRta yuga isalso called satya yuga based on this). This rotation is seen in a dimensionwhere we can relate to it easily in the form of day and night, morning,afternoon, and evening, the four seasons with their constant attributes(rain, snow, heat, etc.,) repeating again and again.He is not only the Creator of Time as we saw in the previous nAma, but He isalso the Administrator of Time as we see in this nAma. This is one of the nAma-s for which the interpretation of SrI BhaTTar andSrI Sankara are purely based on the respective philosophies (viz.viSishTAdvaita and advaita respectively) to which they subscribed. SrI BhaTTar points out that mAyA here refers to knowledge or wonderfultruths, and should not be interpreted as illusion. He is naika-mAyabecause of His innumerable and wonderful exploits. He gives severalexamples to point out the use of the word not as illusion but as truth,knowledge, etc. "mAyAm tu prakRtim vidyAt" - Know that mAyA is prakRti or PrimordialMatter. "mAyA vayunam j~nAnam" - all signify knowledge, according to niruktam. In vishNu purANa, there is mention of Lord vishNu destroying the thousandsof mAya-s of SambarAsura with His discus. If mAyA here refers to illusion,then a discus was not needed to destroy it; so obviously here mAyA refers toreal objects. SrI Sankara gives the interpretation that this nAma refers to His assumingmany forms of illusion. SrI satyadevo vAsishTha derives the meaning from the root mA - mAne - tomeasure, and gives the interpretation that this nAma means that He hasinnumerable dimensions to Him. He who is a voracious eater. mahat aSanam yasya sah mahASanah. The root is aS - bhojane - to eat. Thereference here is to His swallowing the seven worlds.Recall the pASuram "ulagam uNDa peru vAyA". 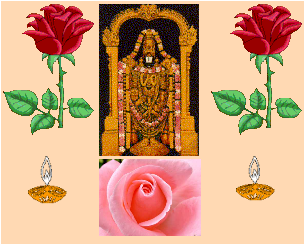 Also we have from tiruvAi mozhi- "kArEzh kaDalEzh malai Ezh ulagu uNDum ArA vayiRRAnai aDa~ngap piDittEnE" - 10-8-2. SrI Sankara refers to His act of consuming everything during the time ofpralaya. SrI satyadevo vAsishTha gives another additional derivation for this nAmabased on aS - vyAptau sa~nghAte ca - to pervade, to accumulate. So inaddition to the meaning that His food is huge, he also gives the alternateinterpretation that His pervasion or vyApti is large or extensive. He Who cannot be seen. "When the entire world has met with destruction, how come this childis alive and lying down (on a leaf)? Even though I try to understand thisthrough the power of my austerities, I am unable to understand the truenature of this child". "katkilI unnaik kANumARu aruLAi- tiruvAi mozhi 7.2.3. katkilI here means One who cannot be seen throughour normal vision. "adreSyam agrAhyamagotram...." (muNdakopanishad 1.1.6), "adRSyam avyavahAryam agrAhymalakshaNam...SAntam Sivam advaitam..." (mAnDUkya 1.7). The dharma cakram writer points out that He is adRSyah because He cannot berecognized through the five senses, nor by logical analysis. For thatmatter, it is only His Grace that can make Him be realized. He of a manifest form. His celestial form is easily visualized by the sages such as mArkaNDeya. "He, who is like the blue lily flower in color, and who is adornedby the SrIvatsa mole, appears to me always as the abode of Lakshmi". "O Dear! His two feet with red surface adorned by the lovely softand red toes, were firmly placed on my head when I bowed with bent head andworshipped Him".Notice that just in the previous nAma we had seen Him to be adRSya, and nowwe encounter Him as vykata-rUpa. The difference is that in the previousnAma we saw that He cannot be seen through the normal means of perception.In the current nAma we see that He is easily perceived by His devotees whohave transcended the influence of the five senses. SrI rAdhAkRshNa SAstripoints out that the ca in the Slokam - vyakta rUpaSca - indicates that evenwhile being adRSya, He is of vykata-rUpa or manifest form to His devotees,through so many incarnations etc. The dharma cakram writer points out that the previous nAma revealed vishNu'sattribute which is beyond our perception, and the current nAma reveals Hisattribute of being present in everything as antaryAmi. SrI BhaTTar interprets the 'thousands' here as referring to thousands ofaeons or Time which He conquers by being in yoga-nidrA while everything elseis dissolved in pralaya. SrI Sankara interprets it as referring to Hisconquering thousands of enemies or asura-s in battle. One whose victory is endless, limitless, countless. He is ananta-jit because He has everything that exists under His control.In every incarnation He alone wins in the end. SrI BhaTTar gives theinterpretation that His mahimA or greatness is beyond comprehension.